I was asked today how I manage and post status updates to the various social networking sites I use. I figured I'd put my answer here in case anyone else might find it useful. Twitter - used to share links & short thoughts "publicly". I mostly use Twitter for professional purposes which for me means mostly technical & business related stuff. I keep this network public. Facebook - used to keep in touch with friends and family. I try not to post much tech/business stuff here since most of my Facebook friends aren't interested! Instead, on Facebook, I post more personal stuff or more "pop culture" type stuff. I keep this network private. LinkedIn - used for professional and networking purposes only. On Facebook install and configure the Selective Tweets Facebook application. It will monitor your Twitter feed and update your Facebook status with your tweet IF it includes #fb. On LinkedIn install and configure the Tweets LinkedIn application. It will monitor your Twitter feed and update your LinkedIn status with your tweet IF it includes #in. Post an update to Twitter and include #fb and/or #in accordingly. Prior to writing The Seven Habits of Highly Effective People the author Stephen Covey reviewed much of the "success literature" (i.e. self help books) written in the the United States since 1776. He found that after World War I the focus of these writings generally changed in what they taught to be the foundation for achieving success. Success became more a more a function of personality, of public image, of attitudes and behaviors, skills and techniques, that lubricate the process of human interaction. This Personality Ethic took two paths: one was human and public relations techniques, and the other was positive mental attitude (PMA) ... expressed in inspiring and sometimes valid maxims such as "Your attitude determines your altitude,"
This differs from what the first 150 years of literature focused on which is something he refers to as "Character Ethic." things like integrity, humility, fidelity, temperance, courage, justice, patience, industry, simplicity, modesty, and the Golden Rule. Covey admits that while parts of Personality Ethic are important and in many circumstances critical--things like communication and presentations skills--these skills are at best secondary. To truly sustain long tern success one must focus first and foremost on Character Ethic. It is primary. A great example he gives is with respect to trust. Everyone can agree that trust is a critical element for success in business, family, and friendships. While Personality Ethic suggests communication techniques / tricks to gain trust, Character Ethic says to just be trustworthy. If I try to use human influence strategies and tactics of how to get other people to do what I want, to work better, to be more motivated, to like me and each other--while my character is fundamentally flawed, marked by duplicity and insincerity--then, in the long run, I cannot be successful. My duplicity will breed distrust, and everything I do--even using so-called good human relations techniques--will be perceived as manipulative. There are people we trust absolutely because we know their character. Whether they're eloquent or not, whether they have the human relations techniques or not, we trust them, and we work successfully with them. This resonates with me because at heart I'm in idealist and always like to think that "the good guy" always wins in the end. It is nice therefore to read something that makes sense and reinforces that belief. It also helps because I think I lack some of those Personality Ethic skills! Funny, as I read about the approaches two specific people stick out in my mind. One who excels in Personality Ethic and one who excels in Character Ethic. How about you? Sometime last year I was looking for new business books to read. 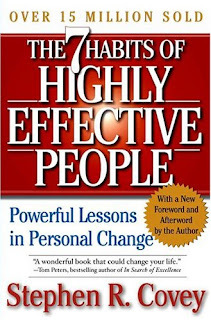 I talked to mentors and colleagues and searched the web to discover that the The Seven Habits of Highly Effective People was in almost everyone's recommendation list. First published in 1989 it is already widely regarded as a classic. I went ahead and ordered it without reviewing what it was all about and without even carefully reading the cover. Last week on a plane trip between Tampa and Boston I finally opened it and began. I've only read two chapters so far but it is clear to me that this is not a "business book" in the traditional sense or at least what I think of as a traditional business book. It would be much better described as a "self help" or "personal change" book and to be honest, had I known that in advance, I probably wouldn't have bought it. Thus far the book resonates very deeply with me. It reinforces some of my core believes but introduces some new and powerful ideas and concepts. It also helps that the core of the book's message appears to address what I know to be among of my largest and quite serious flaws which is that of balance. Most of my current, or in some cases former, colleagues, friends, family, and girlfriend(s) can attest to this weakness. I would suggest that you shift your paradigm of your own involvement in this material from the role of learner to that of teacher. Take an inside-out approach, and read with the purpose in mind of sharing or discussing what you learn with someone else within 48 hours after you learn it. I think this is a great suggestion for this or any non-fiction book. Taking notes and discussing what you read will multiply by several times what you soak in. Coincidentally this also happens to be a great marketing technique to spread work of the book but I will avoid being cynical! I have decided to take up Stephen's suggestion and discuss some of the ideas & concepts that I learn and find interesting here on my blog. I may also post noteworthy quotes to twitter . If you have read the book or have something to add I would love to hear from you. This may take some time since another weakness of mine is slow reading. The lack of support for background applications on the iPhone drives me crazy since it prevents a number of very useful apps from being deployed on it. The one I miss most from my BlackBerry is Google Talk for instant messaging. Today I was thinking about why Apple would disallow a basic feature that every other modern OS supports. I can think of two complementary reasons. The first has to do with user interface. Most users don't understand the very concept of "background applications". I'm not sure I've ever seen a really great UI for managing running processes on a desktop OS let alone a mobile one. Since most applications don't need the feature anyway my guess is that Apple just punted on it. The second reason is more technical. Currently the iPhone only supports application development using Objective-C. More notable is that it is Objective-C without garbage collection. This means that each developer is responsible for his or her own memory management. All but the most egotistical of developers would admit that managing memory is a difficult problem and most of us do a bad job at it. If allowed on the iPhone many of our poorly written applications would run in the background eating away at the memory and slowing the phone down until the frustrated user reboots it. Foreground-only applications means that won't happen since the application will be destroyed after just a few seconds or minutes. As a result I suspect that most iPhone developers do little to no memory management what so ever. iPhone OS will have to support background applications eventually and my prediction is that it will arrive on the same day that garbage collection does.